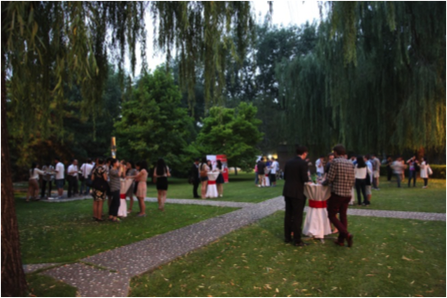 On 24 June 2015, the Science, Technology and Education Section at the Embassy of Switzerland in Beijing hosted a preparatory workshop for Chinese outgoing students in combination with a summer barbeque, for which alumni of Swiss universities were also invited. After a welcome speech by Science and Technology Counsellor Nektarios Palaskas, which officially opened the preparatory workshop at the Residence of the Embassy, Deputy Head Michael Waser started the moderation of five presentations. Ms Wenjie XU, a University of Zurich (UZH) alumna, held a talk on how to adapt to the life in Switzerland. It was followed by a presentation by Mr. Yu ZHANG, an EPFL alumnus and Embassy employee at the Swiss Business HUB (SBH), who shared his insights on what one can do after the exchange program and how to apply for internship positions in Switzerland. The audience was then enchanted by Ms Yining HUANGFU, Media Manager of Switzerland Tourism China, with beautiful pictures of Switzerland’s landscapes and unique cultural activities. Based on feedbacks from various Swiss universities, Mr. Marcel Schneider, Attaché at the STE Section in collaboration with UZH, highlighted the most common, potential challenges of Chinese students in Switzerland. To conclude the comprehensive workshop, Mr. Res Nob, Attaché at the SBH, broached the issue of how to actively interact and make friends with Swiss people. The informal part of the event, which consisted of a delicious summer barbeque, was festively opened with an impressive speech by H.E. Ambassador Jean-Jacques de Dardel in the presence of the students and invited alumni. Moreover, the After Rain Band immersed the barbeque in pleasant jazz tones, permitting a comfortable atmosphere for networking, asking questions or making friends among students, alumni and Embassy staff. Brochures, flyers and other giveaways, provided by several Swiss universities and Switzerland Tourism China, were distributed among the participants, and a toy-catching machine with Swiss souvenirs guaranteed additional fun. With an anecdote about public transportation in Switzerland by returnee and ETH Zurich alumnus Mr. Jialong YUAN, the students got an overall picture of what might lie ahead. All the participants greatly appreciated the Preparatory Workshop and Alumni Summer BBQ 2015. We therefore look forward to hosting a similar event next year and hope that future returnees may enrich it with their own exciting stories or experiences that they will have brought back to China.